Blue_A2_Envelopes_-_4_38_x_5_34 is rated 4.9 out of 5 by 7. Rated 5 out of 5 by Nooooo from Pretty Envelopes Who doesn't like receiving a pretty envelope in the mail ?Jams has beautiful color and the texture is nice. I also like the square flap across the back. I make greeting cards, so I care about my envelopes. The price is fantastic. I've ordered twice now,I will order again. I even referred a friend. Rated 5 out of 5 by papernerd11 from Love the Envalopes! I bought this brand through Walmart first and loved them! I was using them for RSVP cards to my wedding, and needed some more, and found Jam's website so I could order the envelopes directly. I had great service, the package arrived in a timely fashion, and I experienced no hiccups throughout the process. The envelopes are beautiful, good quality, and fit the purpose I had for them perfectly. I would definitely recommend this site, and plan to purchase from here again! Rated 5 out of 5 by MardyO from Love this color!! I am so glad I bought this color. It matches a number of my new cards. I will have to order some more. Hi Gabby. Please refer to your email for additional details regarding samples. Blue A2 whatcha gonna do, whatcha gonna do with these blue A2's? Whatever you do, pick a shade of blue, we’ve got plenty of options ranging from a light to dark hue. 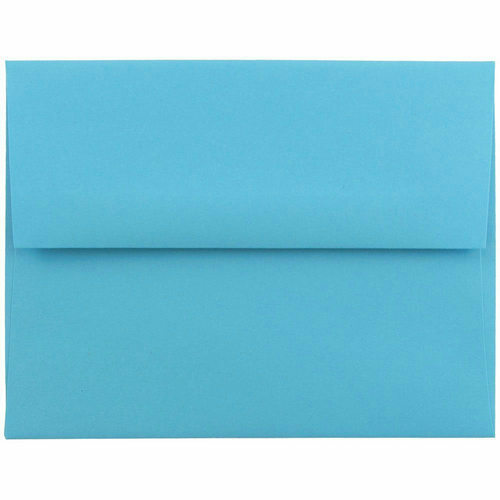 While these envelopes do weigh in on the smaller side of the scale, don’t be too quick to write them off; Blue 4 3/8 x 5 3/4 Envelopes are great for small invitation cards, four-fold greeting cards or smaller post cards. Their cool blue coloring is available in enough shades to satisfy even the wildest of themes. From our Translucent collection that gives your recipients a little guess as to what's about to come to our Stardream collection sure to make your recipient's faces shine just like the envelopes themselves, we really do have it all. Blue A2 Envelopes measure in at 4 3/8 x 5 3/4, they feature a rectangular gummed flap and are available in 19 different shades of blue. Blue A2 Envelopes can be ordered in increments of 25.